Yeah, I’m an Android guy. Android gives you a big screen, widgets, the freedom to customize and pimp your phone. You can get wild. I carry an iPhone for work, and I about tolerate it. Mainly, it’s just heartlessly uncharismatic. Yes, the physical build has great industrial design (except…no back button). But interaction leaves me cold. So what’s it about the Android experience that sets it apart? Which is the modern UI? 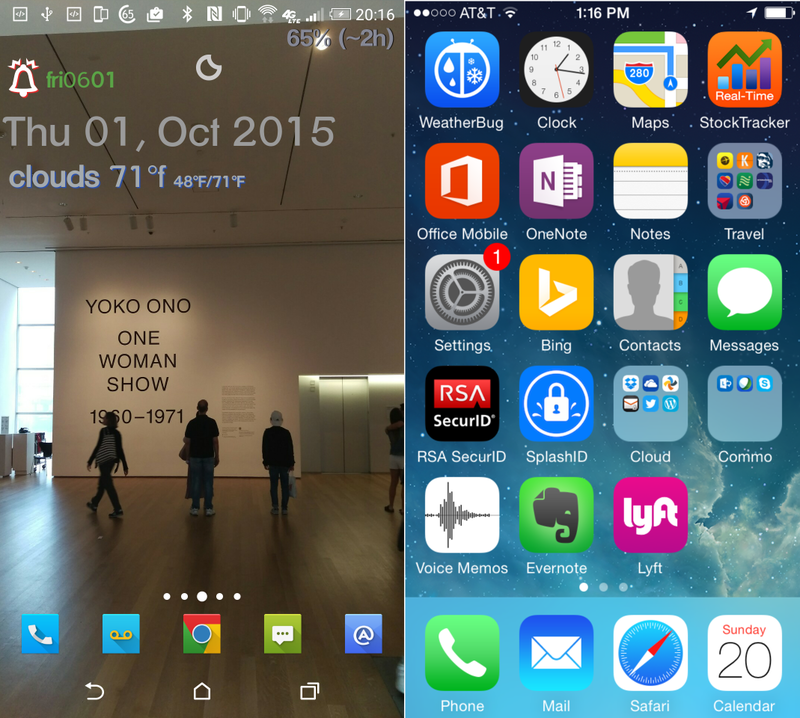 On the left, floating above the photo from MOMA there is a customizable widget with weather, time, date, alarm status. Each piece of information is a hotspot, taking the user to the apps that control that data — weather timeline, calendar, alarm clock. That’s the depth of function you get in a single widget. Contextual, dense, intuitive. The icons at the bottom are my most-used apps, and that quick-launch drawer slides to the side to get at ten other most used apps. That’s function from Nova Launcher, which replaces HTC’s Sense as my interface. Nova also loads with my icon library, courtesy of NOX Icon pack. Is it hard to do this? No, it’s dead easy. About six clicks, once Nova & NOX are downloaded. On the right, with IOS, you have a grid of dead icons. A red badge indicates something needs attention or is new. A brash, low-res and low-information approach. Which is ironic, as ‘Retina’ quality displays were pioneered by Apple and yet they don’t leverage that in their home screen UI. Essentially unchanged from 2007. They’ve done a curious end-around with 3D Touch. But that’s to jump in and do things, it doesn’t help the information density or icon display. Note the Android (HTC One, above) uses the hi-res display to show notification icons on the upper left. These are from apps, so I can see how far long I am on my podcast, what my actual battery charge is, that I have mail or a text. Swipe down and the notification shade will have an entry for each item–to control media, preview email, mark as read or delete, right from the notification shade. Apple doesn’t allow apps to put info on the home screen. Just a badge. Put that app in a folder, the folder gets a badge. Useful? I don’t get it. Apple is the company that’s all about making people feel wonderful. The grid of little bland icons on the iPhone make me feel closed in, trapped. I can’t even put them where I want to! Try to move one and the rest start dashing about. WTH? I can’t move one icon without moving the rest of them? Want Facebook right under your thumb? You might spend minutes pushing icons around to get them where you want them. Got a big screen? A 6+? Icons default lining up from the top…so you might add a bunch of icons to your home screen just to get Instagram or Snapchat down low where you want it–cluttering up the view of your wallpaper–because you can’t have more than 4 icons in quick launch, and you probably have dialer, web, messages, Facebook already there. My Android home screen? It is open and inviting. The power is hidden (active widget, sliding quick launch), and the wallpaper of the day shines through. Switch out the manufacturer’s skin for something you like. Like beaches? Install a tropic theme. Change the appearance of your entire set of icons to some new, interesting theme. And it ain’t hard folks. No batch files to write, no scary menus…just install a launcher, download an icon pack, set up the options, and you can have a phone that is truly yours. For about five bucks. Apple notification shade with widgets (L). Android screen with widgets (R). The Apple widgets live in a pulldown, they all get the same dull background, there is no way to keep them visible and their function is less than in Android widgets. Case in point: in the Apple widget, Evernote shows me two recent notes, that’s it. The Android widget allows me to scroll, onscreen, through all of them, and shows more content. Sure, everyone says IOS is easy. That’s because they’re used to it. But Apple isn’t always more straightforward. Lets take something as simple as the app store. 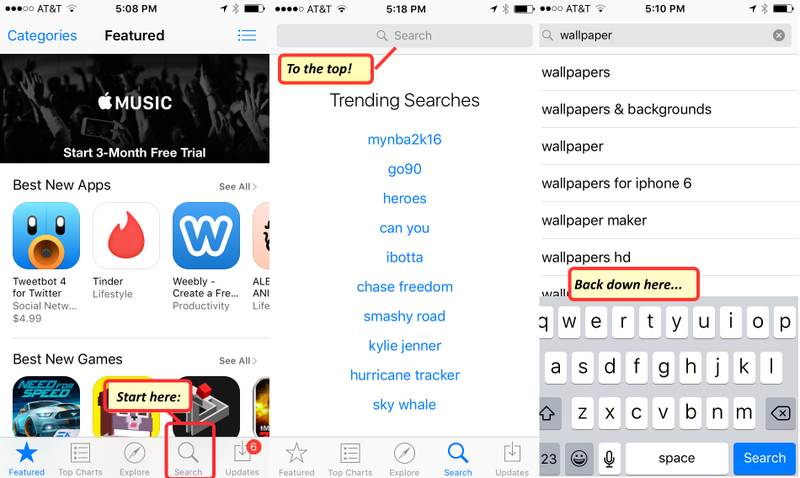 Search icon is at the bottom…but then you have to go to the top of the screen to activate the text search…then to the bottom to enter the text. WTH? 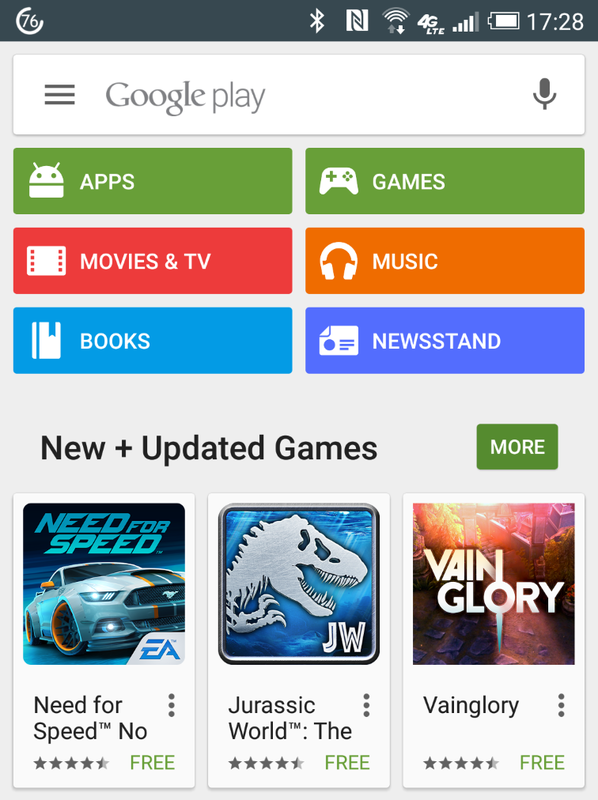 Android app store, with useful categories. Here’s Android: where you search is clearly marked, and no silly “you have to click on the magnifier to search” protocol. Just click and type. Would I rather have search on the bottom, sure, it’s less of a stretch and that’s where the keyboard is. But at least the target is big. And I like the categories listing being handy. Let’s talk a bit more about targets. How about this one: see the illustration below left. 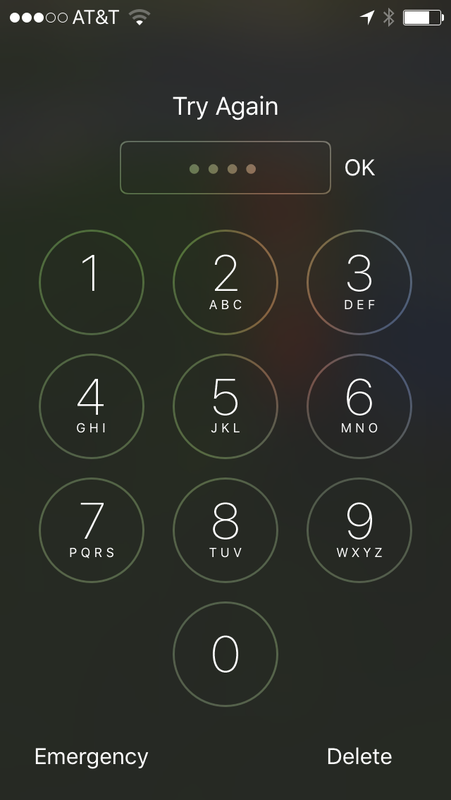 You unlock the iPhone using the nice, big round targets for the numbers. But the ‘OK’ button is tiny, and squished up there against the entry field… Why so small? Ever try to hit that while walking? With your thumb? The Android version I use has a bigger target, nestled right where you expect it, low down near your thumb. I understand, these sound like small things, but reviewers constantly harp about small things like how ugly the camera bump is, or the drilling of speaker holes. Details matter in these days of technological fetishes. I may be complaining about details but at least they are functional, not just aesthetic. These issues truly drive me nuts with IOS and similar ones lurk elsewhere in the interface. IOS Lock Screen. Big numbers, tiny OK button. OK, you say, but Android is more vulnerable than Apple — the closed store with its review process is a walled garden, but it’s big and safe. Big: true, no argument there. More apps, often better, not always. 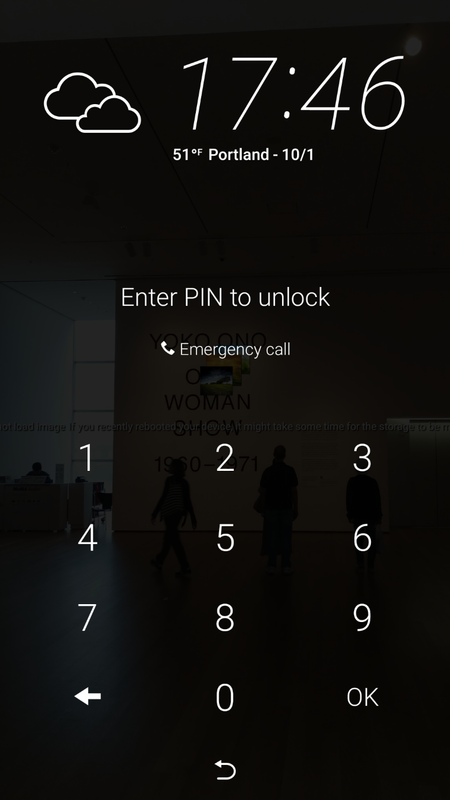 Passcode lock broken, TouchID bypassed, Passcode lock broken again. Macs have been hacked numerous times as well, and the takeaway is, Apple was never more secure than Microsoft or Google. It was only more obscure. Sure, Android has its vulnerabilities too. They’re part of life. The wall around the garden is pretty much meaningless without sensible behavior by users (phishing anyone?) so you might as well join the garden you like best. For me, that’s the little green man’s garden. This entry was posted in Android, Reviews, Technology and tagged Android, Freedom, IOS, Joy, NovaLauncher, NOX Icon Pack, ZooperWidget. Bookmark the permalink.